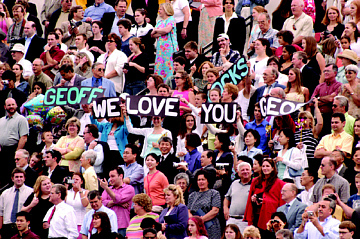 The class of 2004 receives a grand send-off at the universitywide ceremony held Thursday, May 20, on Homewood Field. 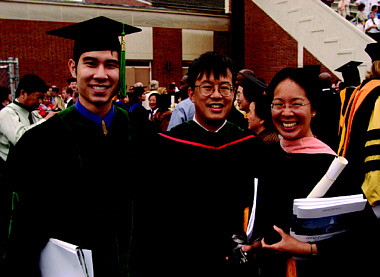 On a day that began short on Fahrenheit degrees, thousands of the academic variety were conferred May 20 upon Johns Hopkins' Class of 2004. It was also a day when comedian Bill Cosby and thousands of chirping cicadas held center stage on the Homewood campus. 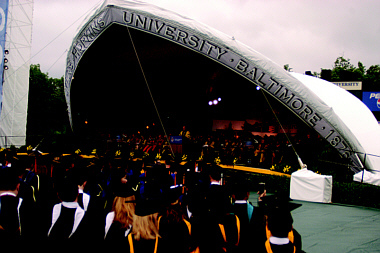 Under brisk and cloudy conditions, the 128th universitywide commencement ceremony started the day off at Homewood Field, where more than 5,800 degrees and certificates were conferred by Johns Hopkins' eight academic divisions, and honorary degrees were bestowed upon Supreme Court justice Ruth Bader Ginsburg and emeritus professors J.G.A. Pocock and Hamilton O. Smith. Divisional diploma ceremonies were held last week as well. President William R. Brody, as is his custom, delivered the universitywide address, which focused on "giving back" to the community and your fellow man. He concluded his remarks with a request. "Though at this moment it may seem out of place, starting tomorrow I want to ask you to give back to Johns Hopkins," Brody said. "This is not a plea for money. The greatest gift you can give back to Johns Hopkins is your personal integrity, hard work and the fruits of your discoveries offered freely to others to make a better world. I am asking that you give the knowledge you have gained here to the world on behalf of Johns Hopkins. Give of yourselves. When you do, I have no doubt, great things will come to us all." 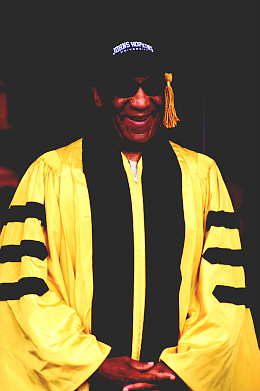 William H. Cosby Jr. in his self-designed graduation cap. 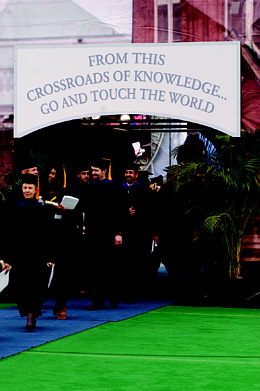 His words appeared to resonate with many of the graduates. 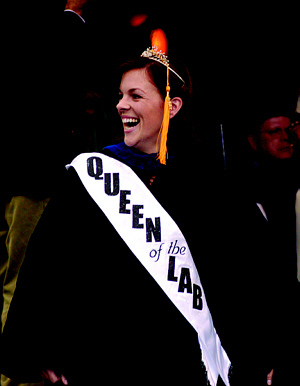 "When I was sitting out there, I was thinking about President Brody's speech, on how we can all make a difference in the world and not to get caught up in the business of all the things [we have] to do," said Karyn Anderson, who received a doctorate from the School of Public Health. 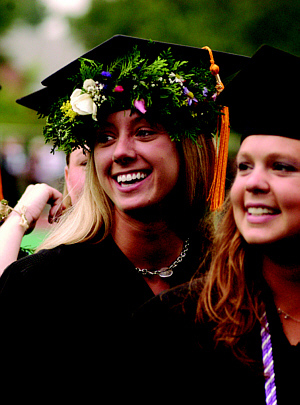 Emily Engle, a Peabody graduate, said that the universitywide commencement offered her a new perspective. "It was very special that all the schools were together for this particular ceremony," said Engle, who would receive her Peabody diploma at its ceremony that evening. "I really felt it was a larger community, and now I think I will really feel like a Hopkins alumna, versus just a Peabody alum. It really made an impact on me." For the afternoon undergraduate ceremony, the skies cleared for a moment and the thermometer climbed. 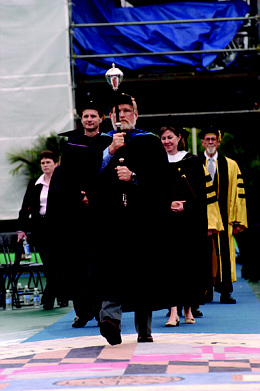 Cosby, who received an honorary degree of doctor of humane letters during the ceremony, addressed the more than 970 seniors graduating from the schools of Arts and Sciences and Engineering. At the podium, Cosby took off his academic robe to reveal a Hopkins T-shirt and sweat pants. 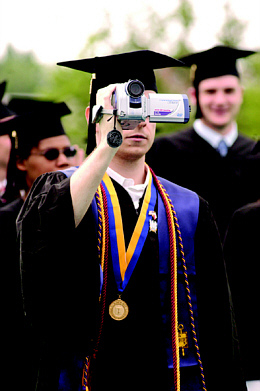 He told the graduates a story from his early nightclub days, when the 20-something Cosby was not yet a household name. 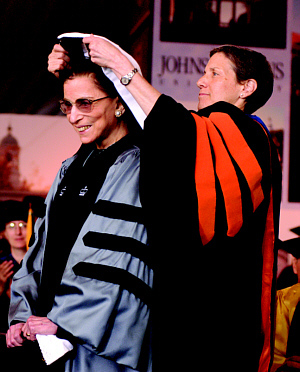 Ruth Bader Ginsburg receives her hood from SAIS Dean Jessica Einhorn. The summer after he graduated from Temple University, Cosby landed a gig at Chicago's three-shows-a-night Mr. Kelly's, where "all the big guys play." Up to that point in his career, Cosby said, he exuded confidence, or as he iterated with his distinctive cadence, "I knew I was good. I was good. I was funny, and I was good." Yet, just before he went out that career-defining night, his confidence failed him, and "demons started to tell me that I wasn't funny." The negativity followed him on stage, where he promptly bombed. Dejected, he ambled back to his dressing room. Moments later the club's owners dressed him down and told him to go back to his hotel and tell the real Bill Cosby to show up. He agreed to do the second show, but this time he let his talent do all the work. He said he ad-libbed for 38 minutes and "just soared." "It's quite obvious why I am telling you this, but then again, you need to hear it. Whatever it is you're going for, you show up. Don't make yourself nervous about something. If you know your stuff, then you show up," Cosby said. "Don't talk yourself into being that person that nobody wants to see. Failure is easy, no problem. It's a bungee jump ... . It is not for you to doubt, not for you to say, 'But what if it falls over?' Because you're headed in that direction, if you think that way. 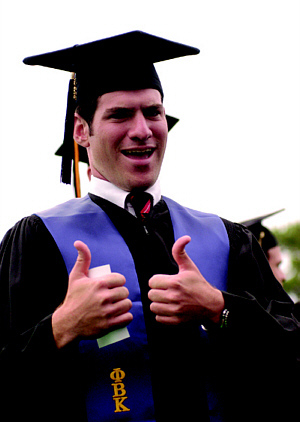 Your education here, I assume, is fantastic [pause, laughter]. Now what you do with it is another thing [laughter]." Following the ceremony, students and their families reunited in a sea of smiling faces. One journey was over, and now began the rest of their lives. "Graduation is a huge thing for the amount of work we put in and the amount of effort we spent doing all this stuff," said Matthew McKee, who graduated with a degree in electrical engineering. "It's pretty neat to finally get here and share the moment with your friends and family." 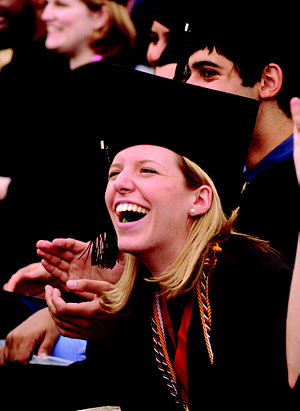 Shelly Solomon said that her post-commencement mood was one of jubilation and realization. "It was all very exciting. I liked Bill Cosby a lot," said Solomon, who earned a degree in public health studies. "I'm still job hunting, and he joked about that in his speech, so that kind of hit home, too." 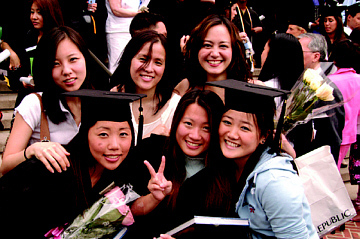 For more about commencement ceremonies, including President Brody's speech, divisional speakers and honorary degree recipients, go to www.jhu.edu/news_info/news/commence04.